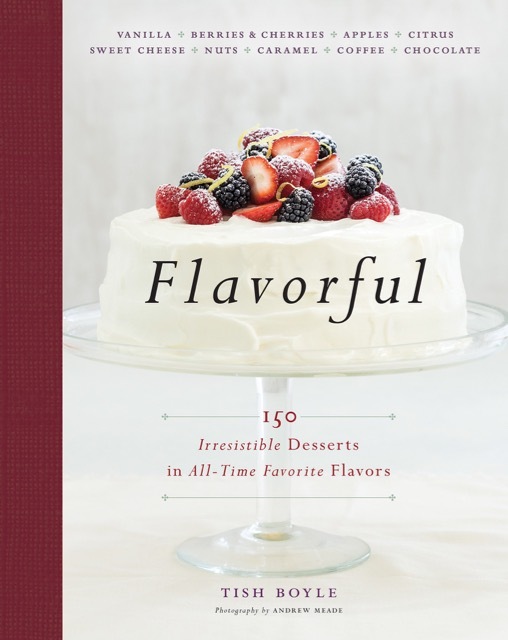 A Book Called Flavorful: Pub Date Today! And what better title could there be for a cookbook! As co-editor of Dessert Professional Magazine, and author of four other baking books, Tish Boyle is an experienced pastry chef and writer of baking instructions so I knew I was in for a treat. As Tish and I share the same editor (and publisher) and are long-time friends and respected colleagues, I was immediately eager to try out a recipe. I love that Tish lists weights in addition to volume and the way the book is organized by yes---flavors. And as caramel is my personal favorite flavor it was the Chocolate-Caramel-Almond Tart with Fleur de Sel that called out to me. Described in the head note as "This seductive tart has a deep, butter caramel almond filling topped off with a thin ganache glaze and a sprinkling of crunchy fleur de sel," it certainly seduced me! As a baker and author myself, it is a challenge to make recipes from another baking author. We each have different approaches so it is difficult to set aside one's own techniques in deference to another's. But the rewards can be learning new ideas and saluting a colleague's expertise as was the case here. If it is true that "the devil is in the details," then we pastry people sure are devilish. We choose different details to highlight, for example, when making the syrup for the caramel, Tish suggests washing down any sugar crystals that form on the sides of the pan with a wet brush. This is good advice because these crystals can cause the entire syrup to crystallize rather than melt into a smooth caramel. My approach has been to stir the sugar and water carefully to ensure that no crystals land on sides of the pan. But rethinking this, I now realized that not everyone is going to be as careful so I'm going to add this to my own upcoming book. One detail that I like to add to my tart recipes is to set the tart pan on a baking sheet, because it is all too easy to inadvertently separate the sides of the tart pan from the bottom when moving it. Also, there is always a little butter that leaks out the bottom. This seductive tart has a deep, buttery caramel almond filling topped off with a thin ganache glaze and a sprinkling of crunchy fleur de sel. 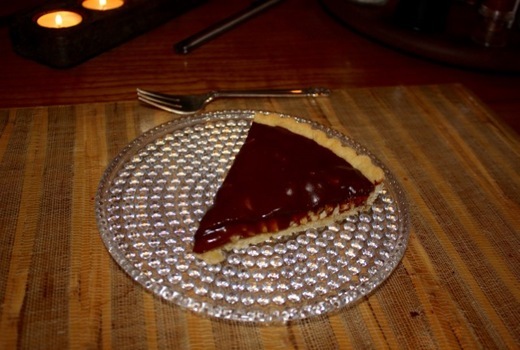 I developed a similar recipe a few years ago; here I've adapted it slightly so that the caramel is slightly firmer and doesn't ooze out of the tart onto your plate (although that is really not such a bad thing). The crust is ultra-simple, and comes together in the food processor in minutes. The dough for the crust can be made up to three days ahead and stored, well wrapped, in the refrigerator. 1. Place the flour, sugar, and salt in the bowl of a food processor and pulse a few times to combine. Add the butter pieces and toss to coat with flour. Blend the butter and flour with about five 1-second pulses, or until the mixture is the texture of coarse meal with some butter pieces the size of peas. Sprinkle the water over the flour mixture and process continuously until the dough begins to clump together. Do not overprocess; the dough should not form a ball. 2. Turn the dough out onto a work surface and shape it into a thick 4-inch-wide disc. Wrap the dough in plastic wrap and refrigerate until firm enough to roll, about 30 minutes. 3. Place the unwrapped dough on a lightly floured work surface. Roll out the dough into an 11-inch circle, lifting and rotating the dough often while dusting the work surface and dough lightly with flour as necessary. Roll the dough up on the rolling pin and unroll it over a 9-inch fluted tart pan with a removable bottom. Gently press the dough onto the bottom and up the sides of the pan. Roll the pin over the top of the pan to trim off the excess dough. Lightly prick the bottom of the dough with a fork at 1/2-inch intervals. Refrigerate the dough in the pan for 20 minutes to firm up the dough. Meanwhile, preheat the oven to 375°F. 5. Toast the almonds on a baking sheet in the oven for 7 to 9 minutes, until golden. Let the nuts cool. 6. Fill a cup with water and place a pastry brush in it (this will be used for washing down the sides of the pan to prevent crystallization). In a clean, heavy-bottomed 2-quart saucepan, stir together the sugar, water, and corn syrup. Place the saucepan over medium-high heat and cook, occasionally washing down the sides of the pan with the pastry brush to wash away any sugar crystals, until the mixture starts to color around the edges. Gently swirl the pan to ensure that the sugar caramelizes evenly and continue to cook until the caramel turns a medium-dark amber color. Remove the pan from the heat and carefully add the cream (the mixture will bubble up furiously). Once the bubbling has subsided, add the butter and stir until completely melted. Whisk in the salt, vanilla, and toasted almonds and stir until the nuts are completely coated. 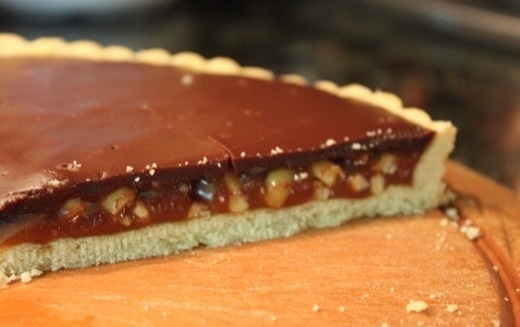 Pour the hot caramel mixture into the cooled tart shell, using a spoon to make sure that the nuts are evenly distributed. Let the caramel cool for 30 minutes, then refrigerate until the caramel is chilled, about 1 hour. 7. Place the chocolate and cream in a small saucepan over low heat and cook, stirring occasionally, until the chocolate is melted. Add the butter and stir until melted and the mixture is smooth. Stir in the vanilla. Pour the warm mixture over the caramel and smooth it into an even layer. Sprinkle the fleur de sel lightly over the chocolate. Refrigerate for at least 30 minutes, until the chocolate is set. Serve the tart at room temperature or slightly chilled. Store, uncovered, in the refrigerator for up to 5 days.